Ricardo Hurtado is an American actor. He is best known for his portrayal of Freddy on the 2016 Nickelodeon television series School of Rock. In 2017, Ricardo appeared in the Nickelodeon television series Nicky, Ricky, Dicky & Dawn. As a singer, he is currently signed with Heard Well record label. He released his debut album, ‘Sun Tunes’ in December 2017. 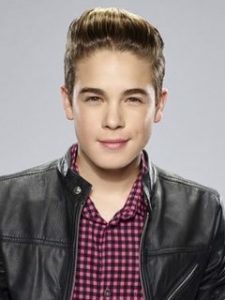 Born Ricardo Javier Hurtado on August 22, 1999 in Miami, Florida, USA, to musician Ricardo Hurtado and Ofelia Ramirez, he grew up in Atlanta, Georgia. Ricardo began his acting career in 2016. He once dated actress and singer Jada Facer. *He was born on August 22, 1999 in Miami, Florida, USA. *He played the role of Freddy Huerta in the Nickelodeon series, School of Rock. *He is best friends with Lance Lim. *Ricardo’s favorite sport is Soccer. *He is fluent in Spanish.